Today was our last day in Muko, and it was one of the most difficult. 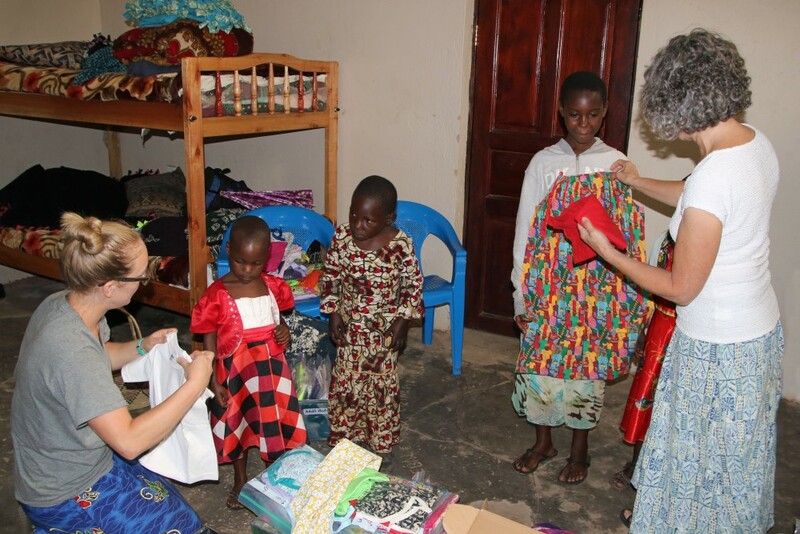 One of the things we do is distribute "pillowcase" dresses/t-shirt outfits made by volunteers in the US. We brought 239 dresses, but we could easily have given away ten times that number and would still not have had enough. The dresses (and shorts & t-shirts for boys) are given to village children only. ACT orphans are not eligible because they already receive considerable help. 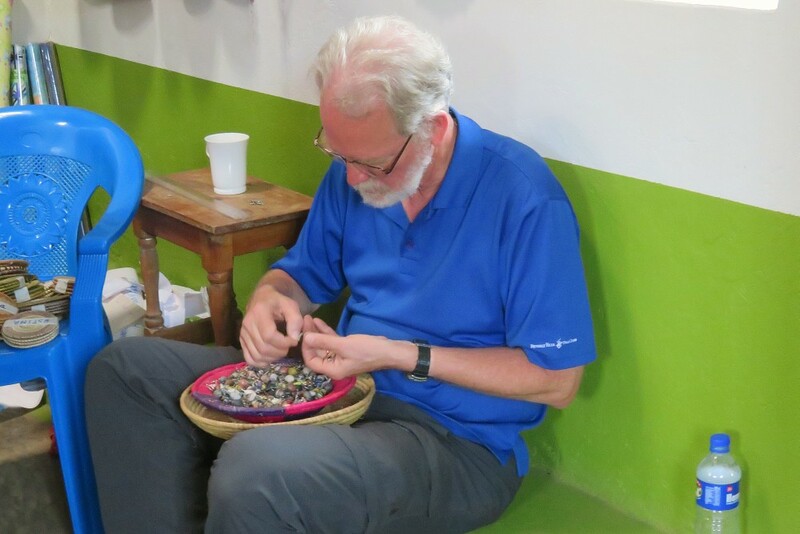 Two weeks before we arrived, ACT volunteers, knowing how many dresses we could bring, went to the villages to determine which children/families were most in need and make lists of who should receive the clothes. The hand-out was scheduled for 1:00 pm. We arrived at the Center at approximately 9:00 am and there was already a crowd. The crowd grew and grew. And grew. The volunteers lined people up and started checking off the names. Many who were not listed were turned away, but very few (if any) of them actually left. While we were waiting for the situation to be sorted, I joined Karen, Nancy, and the orchestra students. Karen was playing "African Blessing," a piece the students are learning to play, on the computer. There's the cello!" she announced. "Second violin... Viola...!" The students were absolutely rapt. She also demonstrated how to find the music on the computer-- her screen was displayed on the TV -- by switching to "Ode to Joy," the second piece the students are learning. Finally, she switched to the Chicago Symphony Orchestra playing Beethoven's 9th. There wasn't time to play the entire symphony, but the kids were thrilled anyway. When the volunteers couldn't hold back the crowd any longer, we set up the boxes of clothes inside the Center and established a path for children to come in, receive a dress, and exit via the back door. Dave V. was posted as a guard at the back door to keep kids from coming in uninvited. At first, the process was fairly smooth. We had sorted the dresses (which were individually packed with a coordinating t-shirt in a labeled Ziplock bag) yesterday, and the children came in 3-4 at a time, which was easily manageable because there were 3 of us working together, plus Sue, who was escorting children in, Sheryl, who was escorting the children out, and Rauben, who was translating when necessary and trying to manage things so that the children who came in would be more or less the right sizes. For each child, we took a dress out of its bag and held it up to make sure it would fit the child. 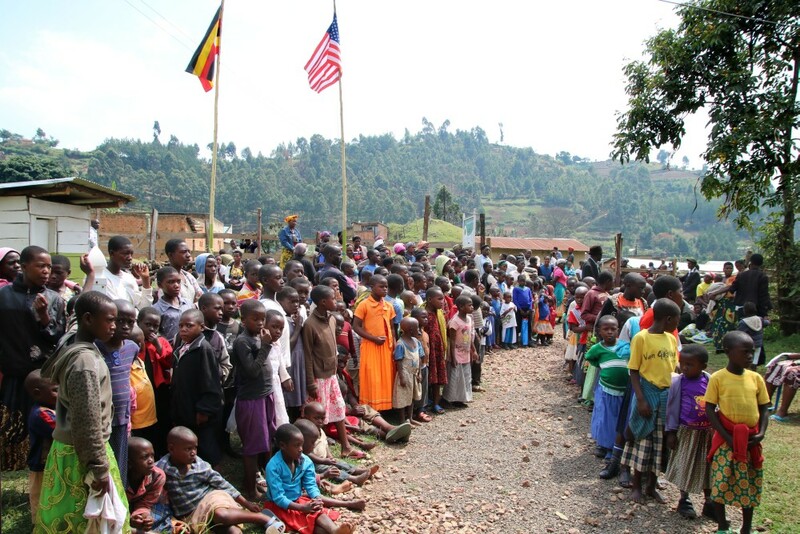 The children accepted the gift, some shyly, others with huge smiles. So far, so good. Then we started finding that many of the dresses were mis-labeled and we had to try several bags before we found one that would fit. And many of the t-shirts were adult sizes -- handing a child (boy or girl) a shirt that was big enough for her or him plus two or three siblings was not comfortable. But the children kept coming. Once or twice we were uncertain of a child's gender -- one little boy objected fairly strenuously when we tried to give him a dress! Not that we blamed him. Then we started running out of certain sizes -- the majority of the dresses were smaller than we needed. And we could hear that, if anything, the crowd outside was larger than ever. I went out to check and one of the volunteers was wielding a large stick -- he wasn't exactly beating anyone with it, but he was definitely keeping the crowd from rushing the door. When we ran out of clothes there was nothing we could do but shut the door, knowing that people had been waiting for hours and we had nothing for them. This was an extremely distressing exercise for us. We wished the dresses could have been divided amongst the parishes and distributed by the volunteers. But they've done this before: they know that there will never be enough for everyone no matter how many we bring. So they have to choose, as best they can, who should receive. And they have to deal with the hordes who come, hoping, even though they were not chosen. We visitors have to do the actual giving and we have to be the ones who close the door. The staff and volunteers, as they pointed out to us, have to live here after we go home. In the future we will probably choose not to repeat the giving away of dresses because it does not really fit with our mission. It is direct aid -- a bottomless pit that in the end often does more harm than good. 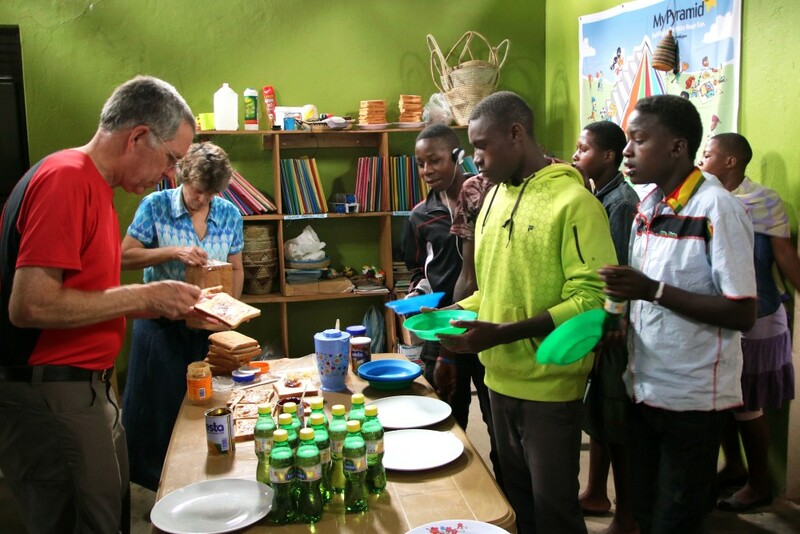 ACT Uganda is about building relationships through sustainable, developmental aid. By the time we finished with the pillowcase dresses, it was time to fix lunch for the orchestra students. 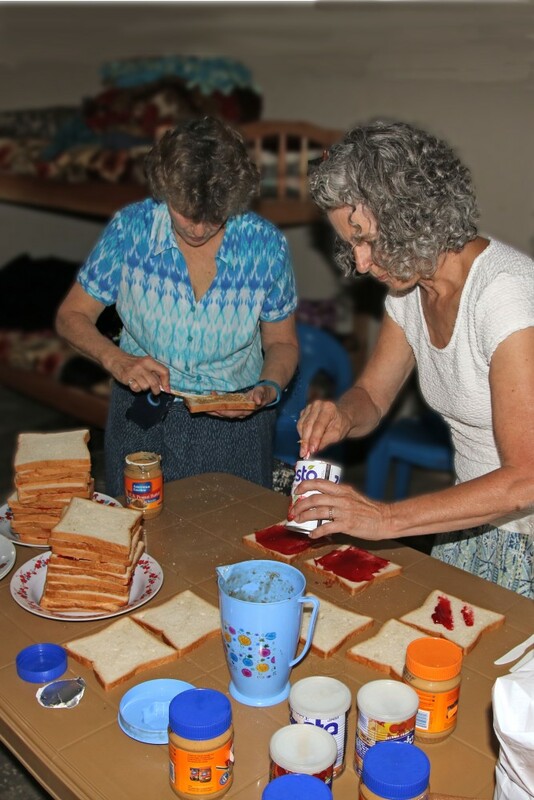 As a special treat, we made peanut-butter and jelly sandwiches (two per student). We also had potato chips and sodas for them. A very popular lunch! We made sandwiches for staff and ourselves while we were at it. Dave M. got to inspect the garden behind the Center today. The beets they planted, using the wheel hoe, less than a week ago have already sprouted! Yay! 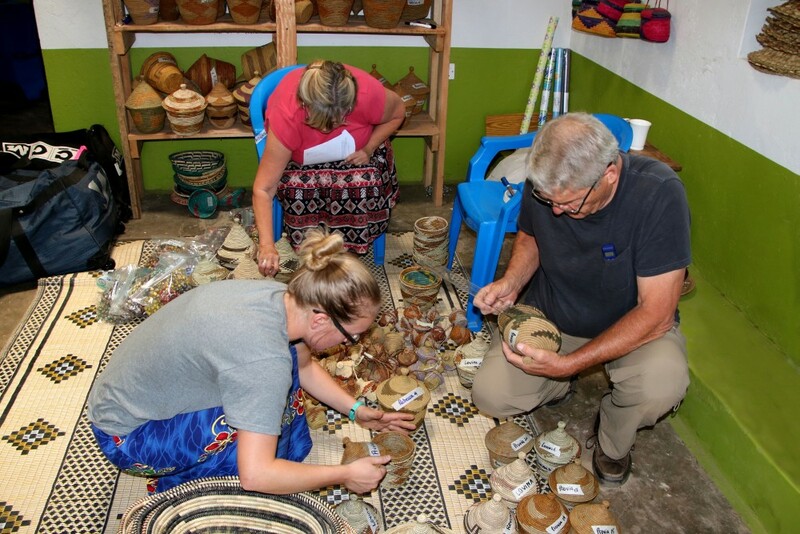 Then it was time to inventory and pack all the baskets and jewelry we're taking back to sell at the Uniquely Uganda store in Midland. Larry and Roger had been working on this all morning; Sue, Nena, and I joined in for the next couple of hours until it was time to go hear the orchestra students' concert. They performed "Ode to Joy" (directed by Nancy) and a D scale, with some exercises (directed by Howard). The challenge was reading music and fitting the parts together -- the things they've been working on with Karen this trip. They were a tribute to their teachers! Below: Crowd waiting for pillowcase dress distribution; giving out the dresses; making PBJ sandwiches; music students coming back for seconds on PBJ; sorting earrings into matching pairs; counting the baskets for packing.